So here we are, Wednesday morn (Montreal time, that is) and Rochelle, our fearless leader, chose Al Forbes lovely image for our Friday Fictioneers. Inadvertently, it is a repeat picture. And, instead of just putting my first story back up, I decided to write a new one. Why not? Good exercise to get that imagination going! Rules and regs are to be found on Rochelle’s blog, just click on her name above. If you want to read more stories, then, by all means, do click on the blue frog! She didn’t see Daddy’s hidden smile, shoulders shaking in silent laughter. 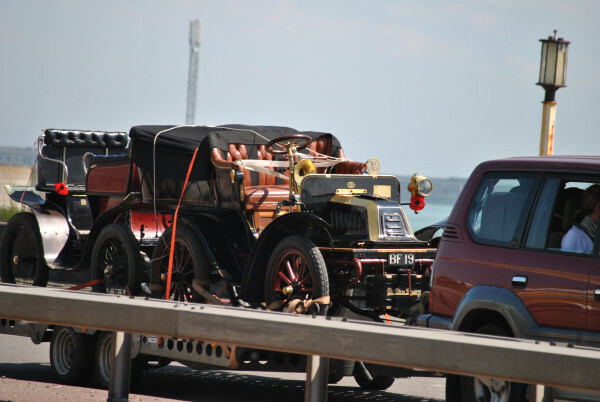 This entry was posted in Friday Fictioneers, Writing and tagged Al Forbes, First cars, Rochelle Wisoff-Fields, Women drivers. Bookmark the permalink. I loved the turn at the end of the story. I suspect she’ll be taking the wheels out for a spin soon enough. 😉 I felt the light breeze blowing through my hair. Love the dialogue. I liked this a lot. Just one question? Did people say “mean machine” then? Now it’s bugging me. Have to come up with something else! Changed it to newfangled thing. Cute story … funny dad! I am so glad it did! Lovely, a sweet tale. I’m glad the Dad realises his daughter can just as easily drive the car. Where did the idea that women can’t drive ever originate from I wonder? Well… I didn’t specify, but I figured Susie was old enough! And driver’s license? Don’t think they had those at first, do you? No, they didn’t at first. But they did later. That’s one generous Daddy. I never, ever got to drive my Dad’s car! Nice one, Dale. Neither did I! But the baby sister did… humph! I have high hopes for this “little” girl. She’ll go far with a father like that. Delightful story. Indeed! Her father was an original feminist! Yes she does…and he loves it! Thank you! Daddy sure does know how to wind his little girl up, doesn’t he? Aw, what a cute way to end it! I like that Daddy seems to know his “little” girl better than she might realize, that’s sweet. There ya go! All you needed back then! And yes…a spitfire of a daughter and a fabulous open-minded father! This would have been my Daddy. The surest way to get me to learn something new, like driving a stick-shift at 12 years old, was to tell me that a girl couldn’t do it. I was so blessed to have had his influence. You plucked my heart strings today. Oh so very glad, Tracey!! This story had a nice natural fluidity. Really enjoyed the upbeat twist at the end. My mother, who is 92, talks about her father’s first car and the fact that he never drove it. He still walked everywhere. BTW my parents were from the Eastern Townships of Quebec. She lived and worked in Montreal during the war. It is a beautiful area. My mother is from Richmond, my father Danville. I still have some relative there. I love visiting it is such a peaceful area of lush farms and good skiing in the winter. Oh wow! A friend of mine is selling his house (would make a great B&B) in Danville. If it weren’t so in the middle of nowhere, I would consider it! Ha ha! A great story, love the humor in this one. Great interplay between father and daughter, it’s not dissimilar to the conversations I have with my daughter who is yet to pass her test and wants to learn in my car. I have a smile because it’s a company car and their insurance won’t permit it. When she passes though, there’ll undoubtedly be further discussions, heated on one side, I’m sure. No doubt… I have two – one just has to pass his test, the other just has to get off his duff and continue his lessons. There is a car rotting in my driveway that they could have shared but will be useless unless they do something! I was allowed to drive the garden tractor, but definitely not allowed to go anywhere near my father’s car, although I remember having designs on his Zodiac when I was 8-years-old! That’s such a sweet story, Dale. Well done. Awww… so is yours! Tractor, indeed!! Well, there’s no doubt he bought it with her in mind. Very realistic portrayal. I like to think so!! Worst thing ever – trying to teach one’s own children how to drive! Don’t I know it! Thankfully they are obliged to take lessons from a school here! Susie sounds like she’s quite independent. I’m sure she’ll be able to convince Daddy she can manage to drive the new fangled thing. She’ll use her long fluttering lashes to do the trick. Loved this, Dale. I could picture all the characters including those shaking shoulders. He probably did, at that! A lovely depiction of a father/daughter relationship. It made me smile. Wonderful dialogue. You’ve made me miss my daddy. Oh for sure, Suzanne! Thanks. Let’s just say the youngest sister got all the privileges of driving Dad’s car… Me and the middle sister, not so much!